NEW YORK—Is there a distinctly American style in fashion design? Was there ever one? Was it found and then lost? These are some of the intriguing questions that arise as a result of visiting An American Style: Global Sources for New York Textile and Fashion Design, an exhibition currently held at the Bard Graduate Center. The exhibition showcases a special moment in American design history when staff at New York’s American Museum of Natural History (AMNH) made it their mission to facilitate the birth of a distinctly American style. The key figures of the movement were curator of anthropology Clark Wissler (1870–1947), assistant curator of anthropology Herbert J. Spinden (1879–1967), curator of Peruvian art Charles W. Mead (1845–1928), and M. D. C. (Morris De Camp) Crawford (1882–1949), AMNH research fellow and Women’s Wear journalist. These men were dubbed the “fashion staff” of the AMNH. “In 1915 they began this very active educational outreach to American designers, to engage them with the collections, specifically the collections of Native American, Mesoamerican, Andean art. They wanted to stimulate this new purportedly authentic American design based on the collections,” said exhibition curator Ann Marguerite Tartsinis. As Europe was embroiled in the First World War, designers could no longer draw their inspiration from European trends. Meanwhile, American factories were also being destroyed or were re-tooled for the war effort. To the “fashion staff” men at the AMNH, this was the perfect opportunity to start over and create a style that was truly rooted in the American culture, be it North or South American. They gave textile designers and manufacturers unprecedented access to the museum’s ethnographic collections. In fact, the exhibition also presents archival images in which designers such as Harriet Meserole, Ruth Reeves, and Mariska Karasz are modelling ethnographic garments from the museum’s collection around 1916. The images also document garments created for the 1919 Exhibition of Industrial Art, which have not survived to this day. The exhibition also features rare textiles and garments ranging from a 1920s hand-batiked caftan-style dress and mass-market hand-blocked silks to Native American and other indigenous dress. 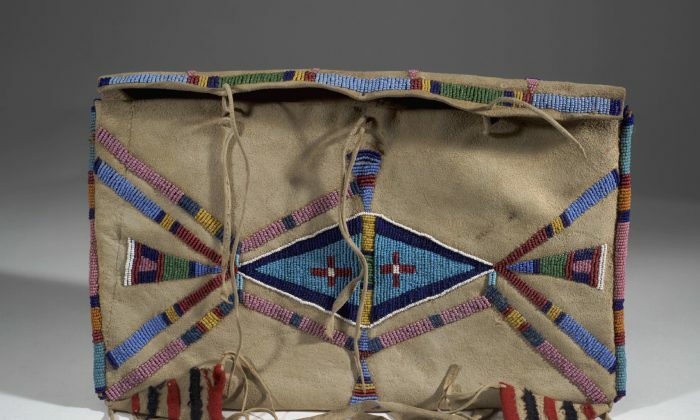 A piece of printed silk illustrates how textile designer Walter Mitsche (1886–1972) was inspired by the beaded elk hide Shoshone bag which is on display right next to it. Mitsche’s design is an interpretation of the geometrical pattern of the embroidery, rather than mere citation. The fruit of the campaign was the production of silk prints designs such as “Inca” and “Shoshoni Tribe” by H. R. Mallinson & Co., which employed Walter Mitsche, and Stehli Silk Co. Though noble, the notion of an American style dissipated in less time than it was coined, despite the fact that it has become very popular for fashion designers to draw from Native American culture. More often than not designers resort to direct citation rather than interpretation. Even then, it does not amount to an American style, but an element in a designer’s annual collection. Perhaps it is due to a shift in how modern culture views indigenous style in general—as something fixed and truly owned by the people of that culture. Whereas the modern world is far more homogenized and fast-paced than our ancestors. We belong to wherever we migrate and all of our belongings reflect this ebb and flow. “The Times They Are a-Changin’ ” sang Bob Dylan in 1964, by which time, the times had already changed, irrevocably. Kristen Stewart’s new movie is requiring the 23-year-old “Twilight” actress to gain more weight at the director’s behest.